MILAN, Jan 15, 2011 / — The allure of the exploration and of Nature combined with sophisticated elegance: the Carlo Pignatelli Outside collection for next fall-winter revolves around two key figures, as the designer draws inspiration from gentlemen explorers – the heroes of exciting and hazardous expeditions. The Pignatelli collection looks on the one hand to Mungo Park, the Scottish explorer who discovered the source of the river Niger, and on the other to the images captured by photographer Herbert Ponting, who accompanied Captain Scott on his expeditions to the Antarctic. 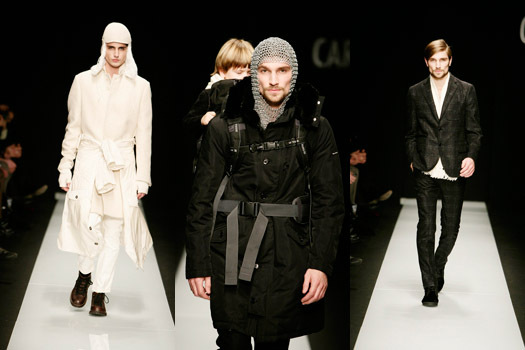 The Fall-Winter 2011-2012 man will be dressing practically and comfortably to protect himself against the harsh elements, yet with a sense of elegance that is both precise and well-defined. The collection marks the return of key sportswear pieces, but with a hint of chic: the Parka and the backpack, for example, are accompanied by classic, traditional garments such as double-breasted suits and double lapels. The tailored feel is more sportive, with zips in chromed or coated metal, athletic vibes for the explorer trousers and hoods and removable linings for the blazers and coats. The Parka is undoubtedly the emblematic garment of the collection. Modern and practical, it protects the suit and is made in floating feather-light nylons. The colour palette is simple and subdued: black and white dominate, giving way to elegant and contemporary shades of cream and silver grey. These are in turn punctuated by intense hues of brown, teal and deep orange. Even the materials are marked by the mix between hi-tech and tradition: tartans and men’s fabric patterns are reproduced even in technical nylons in micro fibre and taffeta, in the laser perforations, in the embroidered jabots of the check shirts. Nature is the predominant element of the collection and characterises the alpaca wool of the Aran-knit sweaters, the fur trim of the outerwear, accessories and ankle boots.